Firstly, thank you so much to those of you who sent prayers and well wishes my way. It means a lot. Over the last few days I haven’t been able to speak about my friends illness without breaking down, now that we know the end is close, but being able to blog about it, and your prayers, have helped. Mum did teach me to knit (after much pestering) in grade 4 – about 7 or 8. I didn’t do much knitting until she was pregnant with my youngest brother. I was 11 and she knitted a layette set for him in lemon, in a feather and fan pattern – hey, it was the 80s and she really wanted a girl :). Actually I think I finished more of it than she did. My mum has other talents. She plays more musical instruments than anyone I’ve ever met. (As a result I play a few myself, but not well). I think mum gets bored with one and so moves on to the next one. Right now she’s focused on the Mandolin and plays in the Western Australian Mandolin Orchestra. 1. Russian (because she learnt it at school). 2. German (because she was married to a German – my father – and we lived in Germany for 6 months). 3. English (the mother tongue). I’m in awe of her achievements -even though she didn’t teach me all of the cool crafty things my friends parents did. Oh, and because I need a new craft, like I need a hole in the head. I’m off to a beading class this evening. Should be lots of fun. No pictures of the snow. The clouds stole the tops of the mountains yesterday. I’ll have to try again tomorrow, if it hasn’t melted. 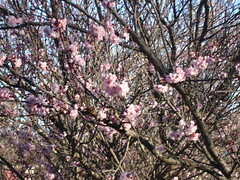 Finally, proof that spring is almost here. 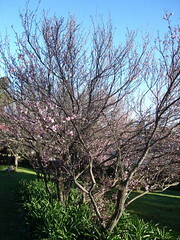 These were taken on campus yesterday afternoon. There’s snow in them there hills! Seriously though, there is snow on the mountains surrounding us. It has been very cold here. Please remember that I am a Brisbane girl and used to balmy sub-tropical weather. I’m going to try and get to a good vantage point on the way home to take some photos. This is my current in the car project, fittingly, I also took the photo in the car. It’s a seamless yoked sweater. I got the pattern from the internet a while back. Details are at home so I’ll post them later if anyone is interested. It’s a nice design, but I found the instructions a little imprecise. Here in South Africa there is a lot of talk about corporate responsibility, and there is also a lot of action. Many major companies sponsor schools and assist with other charities. Our little institution is no different. My husband’s faculty, students and staff, maintain a vegetable garden at a local orphanage/children’s sanctuary. This place provides care to children with HIV/AIDS. I went with him today to help weed. The winter crops are over and next week we will be planting spring vegetables. Next week I’m going to talk with the social worker – she wasn’t in today, to see if I can help out with the babies/toddlers while the students are in the garden. One a sadder note, I’m not sure that the green quilt is going to make it to Australia in time. The girl that it’s for has leukaemia and on Monday we, her friends got an email from her stating that the doctors have given her about a month and that she is now in the miracle zone (that is only a miracle will save her) she’s only 34 and she asked us to pray for a miracle (even though she has come to terms with her own passing – she’d hate to hear me say it like that, she’s instructed her sisters to email everyone with a simple “she’s carked it” message, this has been a fight fought with such tremendous dignity and humour) and so now I’m asking you to pause and say a prayer to whatever higher power you believe in for my friend. Thank you. Finally, a scene of domesticity. 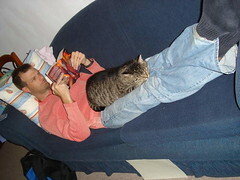 Fat Boy is my cat, Gorgeous Man tolerates him, but I’m beginning to suspect that he has a soft spot for him after all. I’ve been tagged by Kirsten for the Two Truths and One lie meme This was hard for me, because I’m such a truthful person, but here goes. Two of these are true and one is a lie. Can you guess which. 2. My mother taught me to knit, crochet and tat at a very young age. I grew up surrounded by craft and I have been in love with yarn and fibre ever since. She is very crafty and always has some handwork with her. I loved knitting and working on craft projects as a child and I was very good at them. I used to love playing with all of the scraps of yarn left over from her projects. 3. I have lived in the People’s Republic of China. When I was 20 I taught English in a government high school and at a university. I stayed there with 5 other Australians for 10 & 1/2 months. During that time I lost 17.5 kilos (about 38 pounds). I stood on the Great Wall of China and travelled by train to Inner Mongolial. Returing to Beijing there were no sleeper tickets available so I sat for 15 hours in 3rd class with people sleeping above me in the luggage racks and under my seat. Which one is the lie? This is a picture heavy post. On Sunday we went to Robben Island with a group from work. It was my second visit. I took a Brazilian tour group there last month, but it was the first time for Gorgeous Man and, surprisingly for many of the South African staff members. Pretty impressive. The sea was very calm and after about half an hour we were insight of the island. 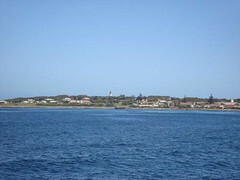 This is the village side of the island. The only people who live on the island now are those that work at the museum – about 150 people. There is one shop and a primary school. In one of those twists of generosity and forgiveness that often stun me about this country there are former wardens and former prisoners now living and working here side by side. The tour itself is very managed and there is no time to wander on your own and absorb the spirit of the place. When we first arrived we were loaded onto a bus – they are still using the same buses that once transported the prisoners around the island – and given a guided tour. This time our guide was an ex-prisoner. 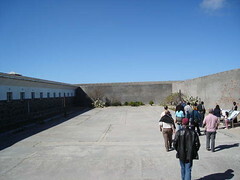 Robben Island has been a prison since the time of the Dutch, dissidents from Java were sent there in the late 1600s and it served as a leper colony until 1931. 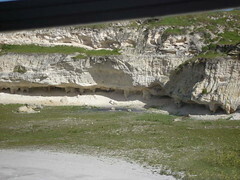 The bus takes visitors past all of these sites and through the limestone quarry where Mandela and the others cut rocks and planned for the future of the country. In our group we had many people from neighbouring African nations, and I was incredibly touched by our guide who thanked them for the help that there countries had given during the struggle years. The prison was quite an experience. We were taken through by another former prisoner. The blankets had to be kept folded like that during the day, failure to do so meant that the prisoner would be punished by solitary confinement without food for 7 days. 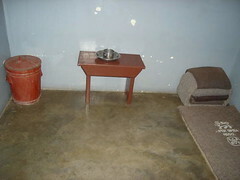 The tin in the corner was used for a toilet and the prisoners had to empty it each morning. The prisoners made a master key to the cells and they used it to smuggle food to those who were in solitary. 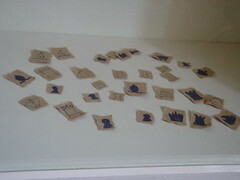 a chess set. Possibly the saddest thing was one of the cells where the locker was empty and on the wall was the statement. “I don’t have anything the guard in charge (gives the name) was hard and he confiscated the things I wanted to keep as mementoes”. It’s the sheer pettiness of apartheid that continues to strike me. One of the most impressive things about Robben Island though is the mood of forgiveness and reconciliation – this has not permeated throughout the society, but the intention is there and this is one of the things that makes this nation unique. We had a really good trip and the weather was perfect for it. 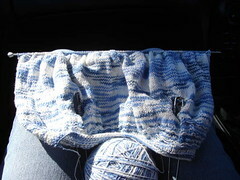 I did lots of knitting in the car on the way there and back, but didn’t take it onto the island. My frustration this week is that I have not been able to find this month’s copy of Australian Patchwork and Quilters magazine in ANY of our local newsagents. It’s been out a week and they are all sold out because the agents only stock one or two copies “because they don’t sell”. The fact that they are sold out in a week and you have customers asking for it doesn’t give you a clue that there may be a larger demand than you think? It’s guild meeting next week, I’ll ask there. First things first. This is the parcel that I’m sending to my favourite colour swap pal. 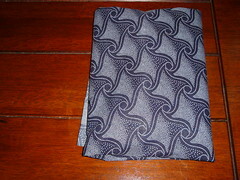 I wrapped the goodies in shwe-shwe fabric which is a traditional African cotton. I hope she likes what’s inside. I’ll show the inside once she has received it. I crawled out of bed at 5:10 this morning to take gorgeous man to the drop off point for the bird watching club as he was planning to go on an all day outing with them. One small problem – when we arrived no one was there. It seems we had some confusion with the dates, and we’ll speak no more about it. After that there was nothing to do except go back to bed for several hours. When we finally got up it was a glorious day. First warm day in ages so we packed a lunch and headed to one of our favourite places here. 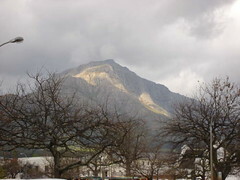 Helderberg Nature Reserve. 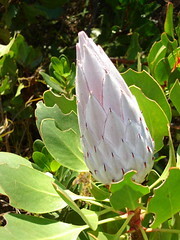 We had a lovely time, there were plenty of birds for Goregeous Man and I saw these flowers. 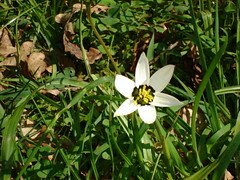 Don’t know what they are, but they were all through the lawns along with myriads of other flowers. I was a little disappointed though, usually we see herds of bonte bok (a type of antelope) and land tortoises there but they weren’t around today. First, an update on the crafting front. I dropped the feed dogs and had a play. I had to rip out the first lot of stitching. It was just too close together (looked good, just not for this quilt) and the back was rather nasty. So I adjusted the tension and it went better, but I’ve decided to use matching thread. Unfortunately this means more ripping out and a trip to the sewing store. The free motion stuff was easier than I expected though. I also worked out what I’d been doign wrong with the knitting that I ripped out, so I’ve cast it back on and it’s my ‘in the car project’. Gorgeous Man tells me that I’m a masochist… I’ll take a picture when it’s more than a few inches. It was gifted yarn that I’m not particularly in love with and so will be a charity garment. 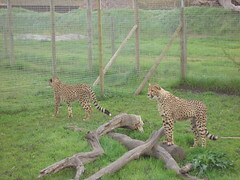 Yesterday I took the students out to Spier to see their cheetah sanctuary (you can also pet the cheetahs for a price). It’s a beautiful estate and well worth the visit. Fabulous restaurants and good african crafts, though a touch on the expensive side. But I found it rather depressing. I’d rather see the animals in the wild… A highlight was one of the cheetahs lying on his back with his legs in the air relaxing – just like my cat at home, but ten times the size. He moved before I could get a photo though. After Spier we drove into Stellenbosh and I turned them loose to go shopping (good English practice). I bought the last thing I need for my favourite colour swap pal from the excellent outdoor market there. I hope she likes it as much as I do. To finish up – just because I am continually amazed by the mountains (Australia is really quite flat – you can drive your car to the top of our tallest ‘mountain’), here is a picture taken from the town square. I loved the play of sunlight on its flanks. Feeling a little sad today. Last week the Democratic Republic of Congo held it’s first free and fair elections in 40 years. The continent of Africa has been watching this closely (it’s been dominating the news) and has been quite hopeful tht the violence there would come to an end. The UN observers were happy with the electoral process and things looked positive. Then yesterday the results were announced and unfortunately the violence has resumed. The morning news reported 25 dead in the DRC capital this morning and so again we wait hoping that the leaders of the two sides will be able to reign in their supporters. On the knitting front, I returned one of my wips back to a ball of yarn yesterday and decided to abandon the pattern. I had to frog it twice and it just wasn’t worth the frustration. Quilting: I’ve finished all the ‘stich-in-the-ditch’ for the green quilt. The quilting did get better as I went along, but there was a fair bit of cursing in the process and I seem to have pulled one of the columns askew. Mind you I don’t think anyone except myself will notice. Tonight I’m going to drop the feed dogs (for the first time) and meaner in the border. I may not be showing the finished quilt. We’ll see. I bought two lots of batting. I wasn’t happy with the first batting AFTER I had pinned it and started quilting so I ripped out the stitching , unpinned the quilt and inserted new batting (I have a project for the old batting). There were two attemps at machine quilting it, before I unpinned it for the second time and sent it to a professional. The quilt was returned from the quilter’s two weeks before the house was packed to move to South Africa. When I arrived here the fabric I’d bought for the binding was missing so a second binding fabric was purchased. It took two years to complete, from beginning to end (not that I worked consistently on it). The making of subsequent quilts has been a somewhat smoother process. Well that’s enough rambling for today. Tomorrow I’m visiting a wine estate and a cheetah sanctuary (for work no less) so I should have some good pictures from that. What I read: Finished reading Timequake Kurt Vonnegut. There were a few moments that I really enjoyed. Some sentences with a really sharp point, and a few sharp comments on the way television impacts on literacy, but generally I didn’t like it as much as some of his other work.